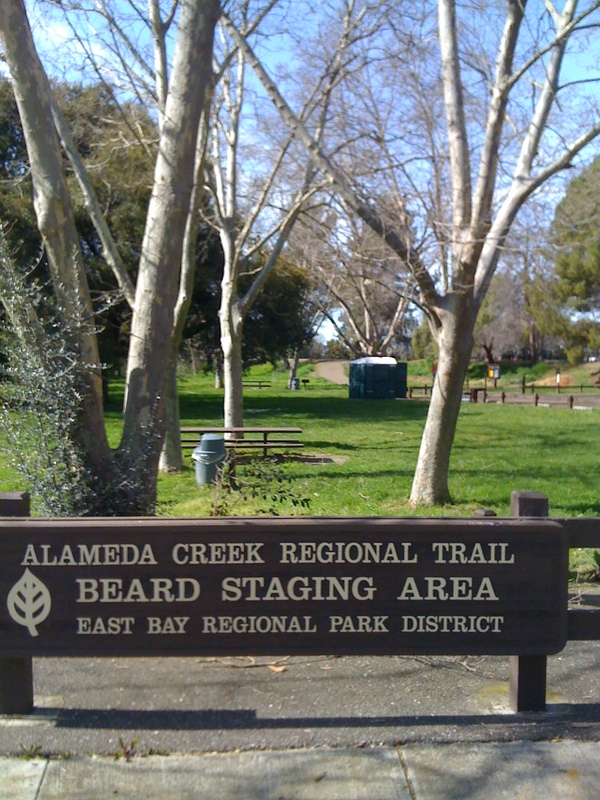 Well, I’ve kicked off my start of the East Bay Regional Park District’s (EBRPD) Trails Challenge 2010 with a short and quick five mile run in Fremont. The trail was actually 4.5 miles but I decided to get in at least five miles. There is a longer route that takes you clear to the Bay and ends up being 12.3 miles. And there also is a shorter course of 2 miles. I selected this course because I first stopped nearby at Ardenwood Historic Farm to pick up our Trail Challenge t-shirts. Last year’s shirts are definitely the best of the three years that I’ve participated but, hey, what do you want for free? 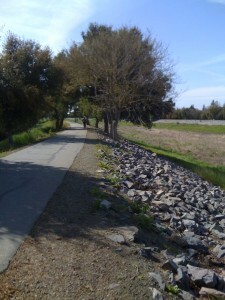 The trail I started with is the Alameda Creek Regional Trail. They have you start at a staging area located at the end of Beard Road in Fremont, not too far off the 880 Freeway. As I really didn’t have the time to do the 12 mile run, I pushed the five mile run at a faster pace to make it more of a speed workout. I ended up getting the overall pace down to 7:13 min/mile. It wasn’t too difficult as this trial is paved and flat except where you duck under freeways, roadways and train tracks. I’d have to imagine that this trail gets pretty busy on the weekends. I ran the trail on a Thursday in the early afternoon. There were several bikers and just a handful of hikers. I may have to visit again to do the longer route that takes one down to the Bay by Coyote Hills Regional Park. Also, there was just a small stream of water in the creek bed but where I passed under the 880 Freeway you could see that the water can get very high as there was debris that had gotten caught up quite high on the support posts. The EBRPD Trails Challenge 2010 consists of 10 featured parks located in Fremont, Lafayette, Antioch, Livermore, Walnut Creek, Castro Valley and Richmond. For each of these parks there are three trails of varying lengths and levels of difficulty. The trail I ran was considered “Moderate”. This obviously was due to the distance and not the terrain. The other cool thing the fine folks at EBRPD have done this year is to have mapped out the trails on Google Maps. I’d definitely recommend signing up for this challenge and get out there and find some new favorite places to escape and exercise. The trails and guidebooks from previous year challenges also are still available online, so, check those out too if you haven’t already. Four more trails to go, or 22 miles. See ya out there!